Bitcoin’s popularity is soaring in South Africa where it is being viewed as a safe-haven from increasing political and economic uncertainty. The issue of land reform in South Africa has become a source of concern following the election of new president Cyril Ramaphosa last month. It remains a highly-politicized topic along racial lines even twenty years after apartheid ended. 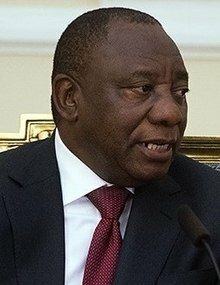 Now Ramaphosa’s party, the ruling African National Congress (ANC), has vowed to change the constitution, allowing white-owned property to be taken without compensation and redistributed to blacks who do not own any farmland. This promise has unnerved Goldman Sachs and, in particular, Moody’s, a global agency, which provides international financial research on bonds issued by commercial and government entities. Last Wednesday, the newly elected president reassured the economic ratings firm that such a move would not have a negative affect on South Africa’s economy. “President Ramaphosa reaffirmed that accelerated land reform will unfold within a clear legal framework and without negatively affecting economic growth, agricultural production and food security,” the presidency said in a statement. Adding to the concerns are other economic problems including a high unemployment rate of over 25%, the recent demise of the country’s VBS Mutual Bank amid a “severe liquidity crisis,” as well as the highest rate of economic crime (77%) in the world, according to PwC’s biennial Global Economic Crime Survey. But to those who have been into Bitcoin since the Cyprus banking crisis of 2012-13 (not to mention the resulting spike in BTC price), South Africa’s soaring interest in Bitcoin likely won’t come as a surprise. Furthermore, Mati Greenspan, market analyst at eToro, noted that there was a noticeable surge of South African Bitcoin traders on the platform amid the heightened political pressures over the past year. In South Africa, the number of new users trading bitcoin through eToro rose by 671% from January to the end of November last year over the same period in 2016, more than the 574% overall growth. The trend is also supported by rising volume on LocalBitcoins, a global peer-to-peer trading Bitcoin trading platform. Statistics show that there has been a considerable increase in bitcoin buying over the past year comprising over 20 million ZAR ($1.7 million USD) in the past week alone. South Africa is also not the only African nation where Bitcoin is viewed as a haven from political and economic turmoil. 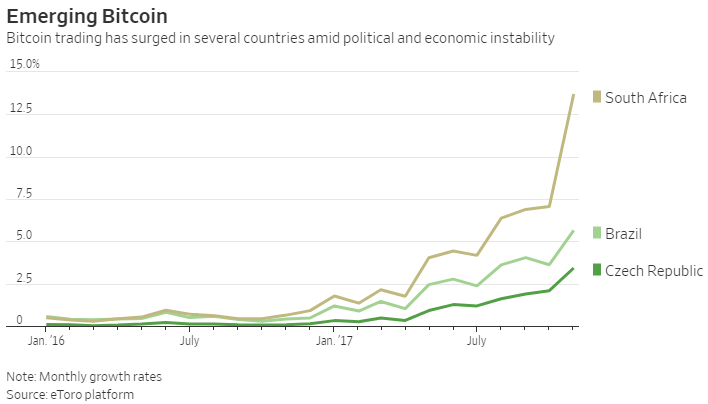 Sudan and Kenya have also seen a surge in Bitcoin interest over the past year, the Wall Street Journal reports. Is Bitcoin becoming the a haven amid political and economic instability? Share your thoughts below! PREVIOUS POST Previous post: Is Blockchain-Based Lottery to Intervene the Online Gambling Market?